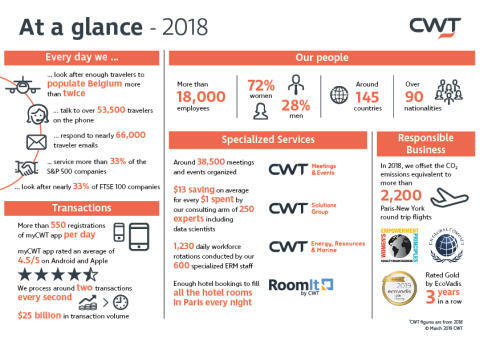 CWT, the B2B4E travel management platform, today reported a strong performance for 2018, with a significant increase in transaction volumes, sales, and revenues. CWT reported a strong financial performance for 2018, with transaction volume up 6.1%, revenues up 4.9%, and US$ 1.7Bn in contracted new sales, driven by growth in North America and Asia Pacific. In line with our aim of being the world’s leading Business-to-Business-for-Employees travel management platform, and, in keeping with our CWT 3.0 Strategy, our focus remains on customer experience, high growth opportunities, core execution, and culture. Our 2018 results clearly demonstrate the impact of our successful achievements in these areas. CWT Energy, Resources, & Marine provides travel management solutions for many of the world's leading companies in the oil & gas, mining, offshore, marine and alternative energies industries. 2018 revenues remained stable compared to 2017. CWT Meetings & Events is CWT’s meeting & events division. It delivers innovative, high-quality projects for our clients across all industry sectors globally. Our creative know-how helps us deliver awe-inspiring events, and our logistics expertise guarantees professional meeting services, group travel, and compliance. In 2018, CWT M&E revenues increased 6%. CWT Solutions Group is the consultancy arm of CWT. 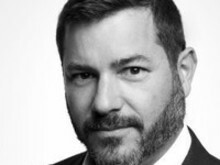 Solutions Group helps deliver travel procurement efficiencies through innovations in supplier sourcing, data intelligence, traveler management and mobility. In 2018, the team achieved 4.2% revenue growth, and notable developments, a next-generation data insight, reporting and visualization tool. RoomIt by CWT™ is the hotel distribution division of CWT. Every day we match travelers with the right room at the right rate, and every minute we book over 30 hotel rooms. We also provide travelers with the amenities and loyalty programs they want, while helping organizations control their budget and improve travel oversight. In 2018, RoomIt revenues grew 12.8%. * On a constant currency basis, including joint ventures but not the international partner network. ** Annualized contracted new sales, excluding renewals, but including joint ventures, with no comparative to prior year. *** On a constant currency basis. CWT is a Business-to-Business-for-Employees (B2B4E) travel management platform. Companies and governments rely on us to keep their people connected – anywhere, anytime, anyhow – and across six continents, we provide their employees with innovative technology and an efficient, safe and secure travel experience. Every single day, we look after enough travelers to fill more than 100,000 hotel rooms, while our meetings and events division handles more than 100 events every 24 hours.